Researchers at Cornell have created mice whose heart muscles have been genetically engineered to fluoresce when the muscles contract. Junichi Nakai of the RIKEN Brain Science Institute in Wako-shi, Japan, developed the fluorescent molecule by modifying a green fluorescent protein (derived from bioluminescent jellyfish) and making it glow brightly enough to be observed in the working heart. The sensor molecule turns on and off like a switch in the presence of calcium; calcium concentrations in the muscle increase with each muscle contraction. In the graphic shown above, the heart of a mouse embryo goes from a resting state between beats (upper left) through upper heart chamber contraction, then finally lower heart chamber contraction (lower right). Incredibly, in order to photograph a mouse heart beat (the mouse embryo's heart beats 6-10 times per second), a special camera cooled to -90 degrees Celsius is used to get a sharp image. By the tenth day of development, a rudimentary heart is already beating, but it has only two chambers. The upper chamber contracts first, then the lower; this delay in contractions is obviously necessary for efficient pumping action. However, the atrio-ventricular node (AV node) does not develop until the thirteenth day; so, how does the heart function without it? This technique allowed researchers to discover a layer of specialized cells on the surface of the developing heart that delays the beats between upper and lower chambers. These cells die off once the AV node has developed. This isn't really a case in which science fiction has specifically anticipated a real scientific development, but I couldn't resist the story. In the movie E.T. 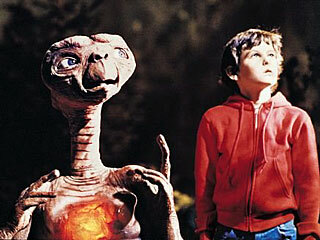 the Extraterrestrial director Steven Spielberg shows E.T. 's heart glowing as he communicates with his fellows aboard their ship. For more miraculous mice stories, read Lab Mice Unexpectedly Regenerate Limbs, Organs, Klotho Anti-Aging Mouse Gene and Yoda - The World's Oldest Mouse. 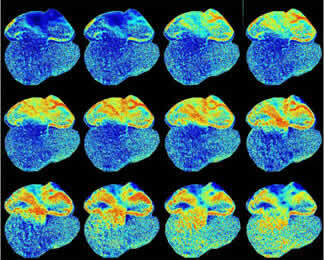 Read more about mice with glowing hearts.